Forms are the beautiful face of your database’s input function. Earlier internet era has lots of web forms in the websites. For each and every request you have to fill a form and the request will be processed manually. Now we have several automation tools to make our workflow easier. Once a request a received, an automated email will be sent to the user’s email address. The modern web forms must be able to meet both user’s need and the web master’s needs. In this list, we have collected some of the cool looking CSS forms designed by creative minds like you. Not only the design but the code structure of these forms also have the latest features. Pick the form you love and start using it on your website or application. 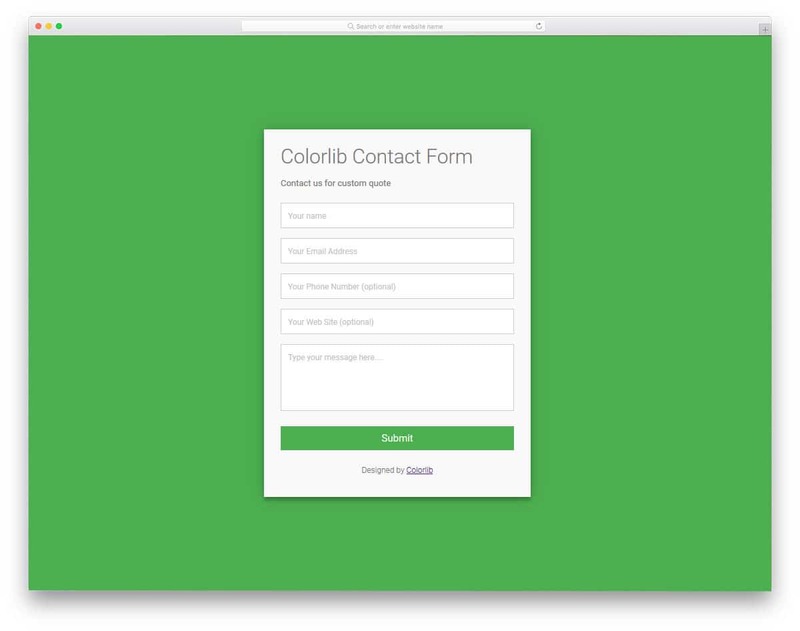 Colorlib Contact Form is a traditional contact form with a simple design. The straightforward design of the form makes it easily blend in with any type of website. Rectangular text boxes give you an ample amount of space to input text and read it. Form fields in this contact form support field validation so the users will be prompted with a heads-up message when they miss a field. Form filed labels are used to show what detail has to be added in a particular form field. The default font used in the form is crisp and clear to read. But if you use a different font on your website, you can easily customize this form to add your font. 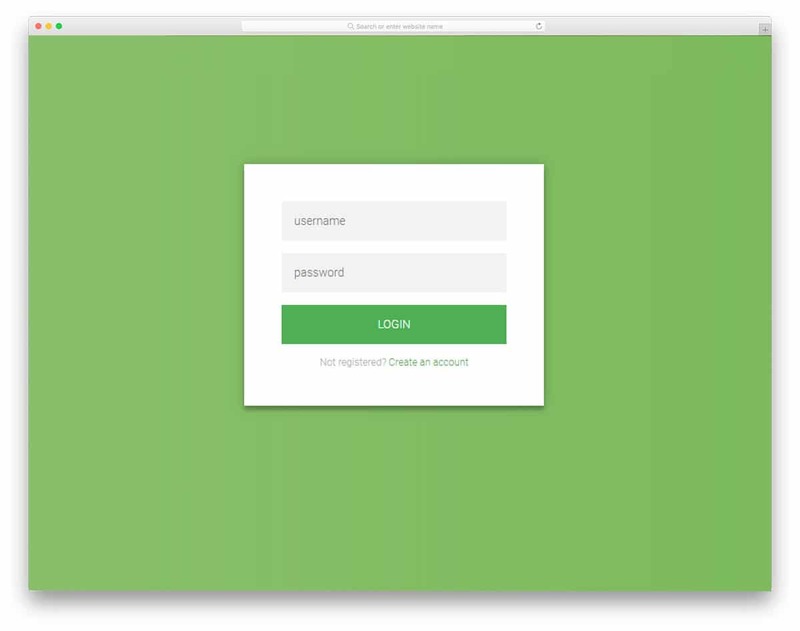 Login Form v1 is an interactive login form. The creator of this form has used the hover effect to give a unique experience to the users. 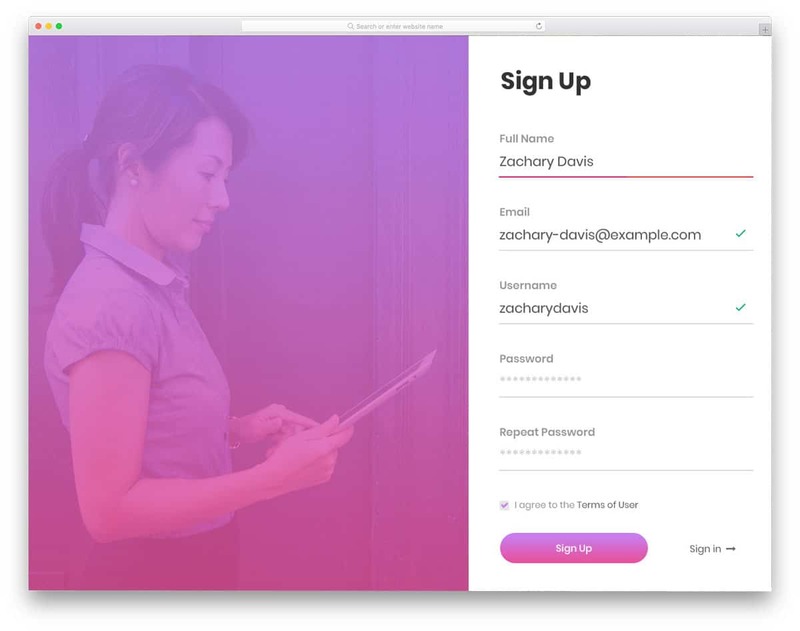 Bold text effects are also used for the form fields on the login form. If you are looking for a proper form for your modern website, this form is worth a try. You can use your company logo or elements related to your brand for the element on the left. Since all these effects are made fully using the latest HTML5 and CSS3 framework, the form will load faster. Ample amount of space is given between each element so you have more space. Contact Form v1 is almost similar to the login form v1 mentioned above. If you want you can use both the forms on your website so that you get a design consistency throughout your website. The form fields on this contact form are fully functional from the front-end. All you have to do is to take care of the back-end integration part. Since the developer has followed the code structure followed by industry professionals, other developers can easily work with this template. 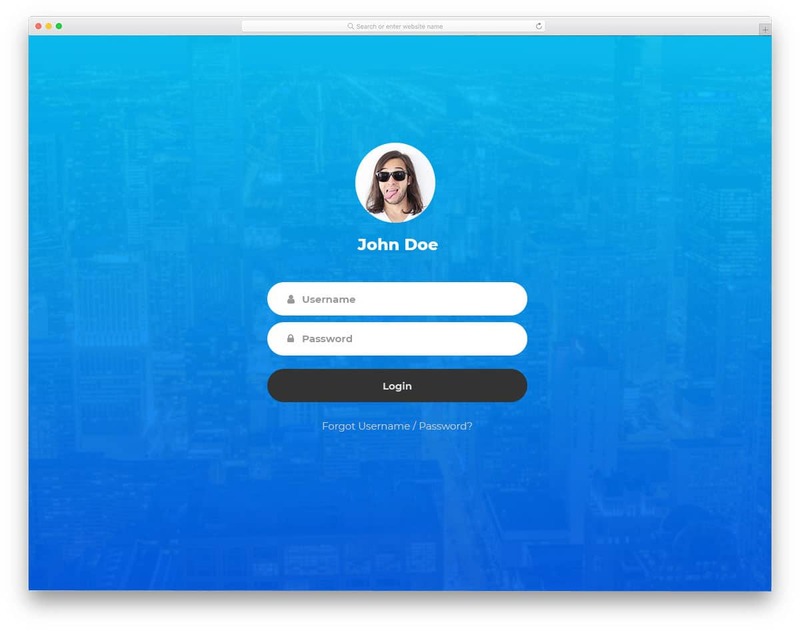 Like the V2 login form, this one is also made purely using HTML5 and CSS3 framework, so you needn’t worry about any lag and prolonged loading. 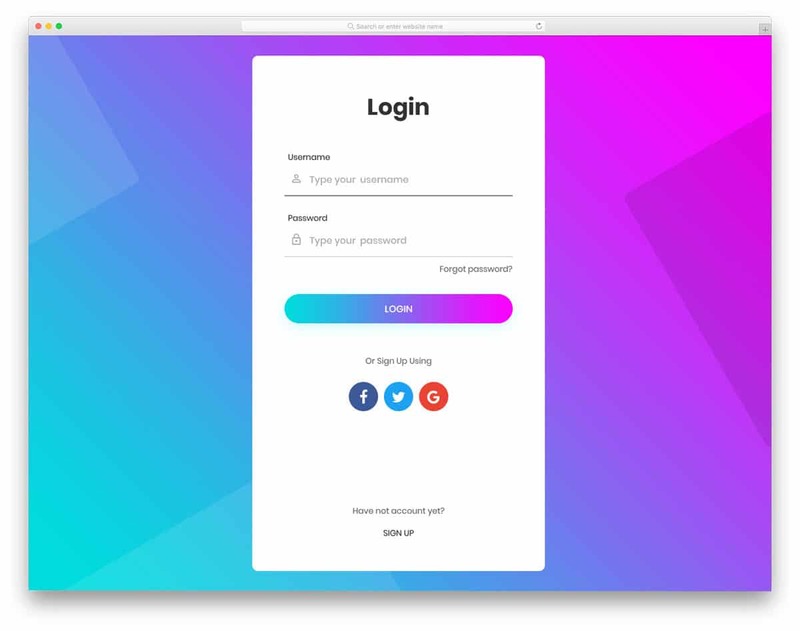 Login Form 5 is a colorful modish looking login form. 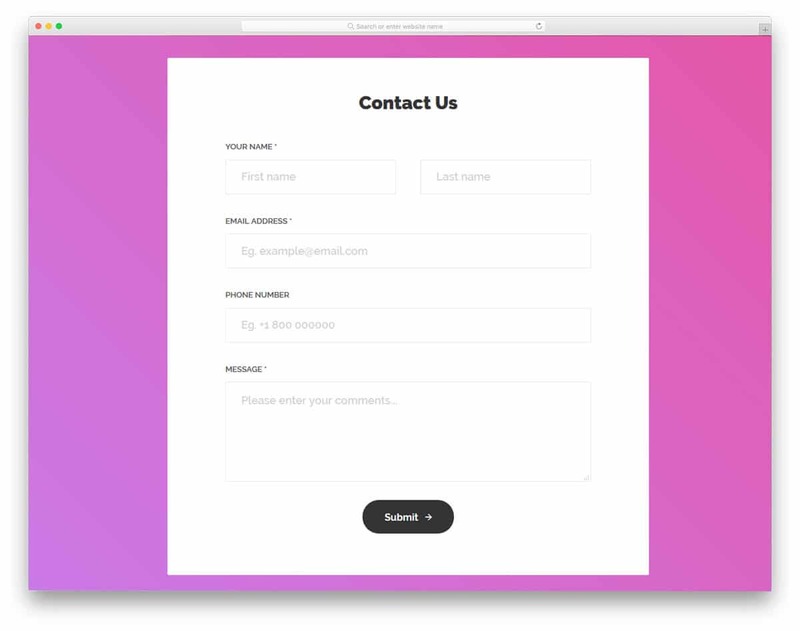 If you are making a colorful website, this contact form would be a perfect addition to your website. As most users prefer to use social media login and Google login option in order to avoid the trouble of remembering many passwords. Many data privacy concerned experts recommend you to follow the email login option as you don’t know what are all the details the website will get from your social media account. That too after several Facebook privacy issues, it is better to think where you use a social login option. Coming to the login form 5, you have all the options placed at the most accessible spots. You can use this form straightaway on your website without any hesitations. If you are running a physical store or having an office, showing it on a map is the better way to communicate with your site visitors. The split screen design of this template gives you an ample amount of space to show the map one side and the form on the other side. A full-screen option is also given in the map to let the user clearly see and interact with the map. The developer has integrated the map with Google Map, so you needn’t worry about backend part of the map. 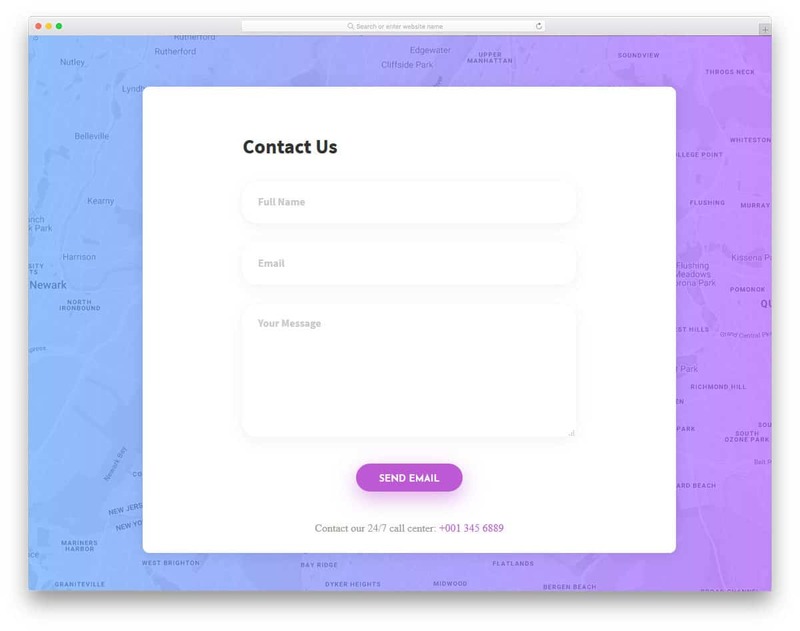 If you are concentrating on your local audience, contact form like this will help your store a lot. Speaking of stores and promotions, take a look at our free eCommerce website templates for beautiful websites with many useful features. Login Form 13 is actually a registration form. Just like the Contact form v13, this one also uses split screen design. The split screen design gives you more than enough space to add an image. You can use this image space to show some of your photographs if you are using it for photography websites. Or you can show some animated illustrations of the benefits the user will get by registering on your website. The form fields support field validation and a message is shown to the user when there is an error in a form field. This form can also be used for other purposes as well. The developer has kept the code structure really simple for easier customization. Contact Form v5 gives you drop-down options and regular form fields. If your organizations have multiple departments, letting the user select the department will reduce your work. For example, on a hospital website, there will be multiple departments and each has its own schedules and procedures. Letting the user select a department will help you address the issue and get back to your client easily. Code structure of this form is kept very simple so that you can easily integrate with any modern platforms and tools you use to manage your customers. By making a few optimizations, this form can be easily used on your website. Login Form 9 is a trendy looking form which can be used for both websites and mobile applications. The creator of this form has made it responsive so you can use them on your existing responsive website easily. Shadow and depth effects are used to differentiate the main form fields and the background. The simple design of the form makes it easily fit in any type of website. Especially in minimal websites, this form blends in well than any other forms. At the bottom of the form, you have the option to link signup form. But in the default demo, you don’t get the registration form. So that might be something which you have to make by yourself or you can simply use a registration form mentioned in this list. Contact Form v3 is a dual purpose form, which you can use as a contact form and a quote requesting form. The user has the option to switch between the forms they want. 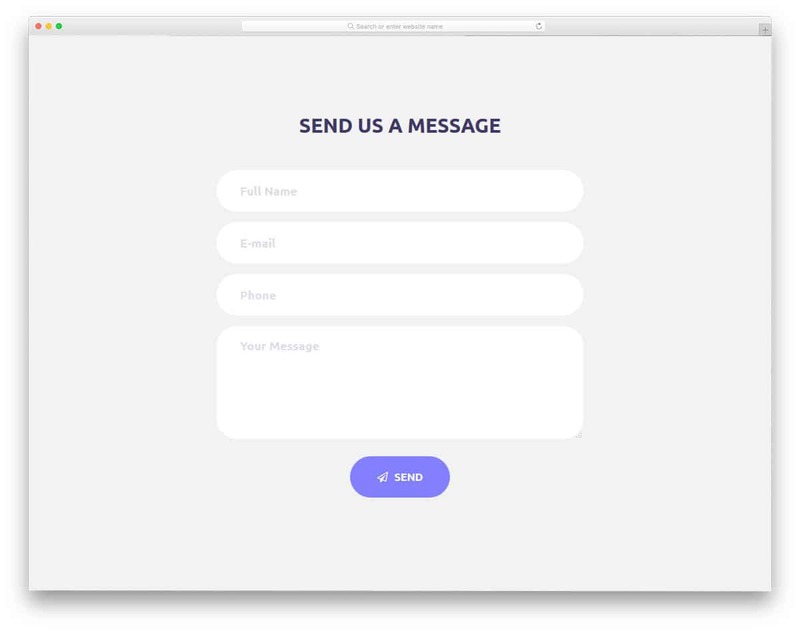 Transitions and animations are fluid in this template, so the user doesn’t have to wait for the form to appear. Subtle text field animations are used to indicate which field the user is editing. In the quote requesting form, you get drop-down fields to make the input process more simpler for the user. This elegant looking, functionality-rich form has a very simple code structure. Hence other developers can easily work with this form and integrate it with the tool they want. 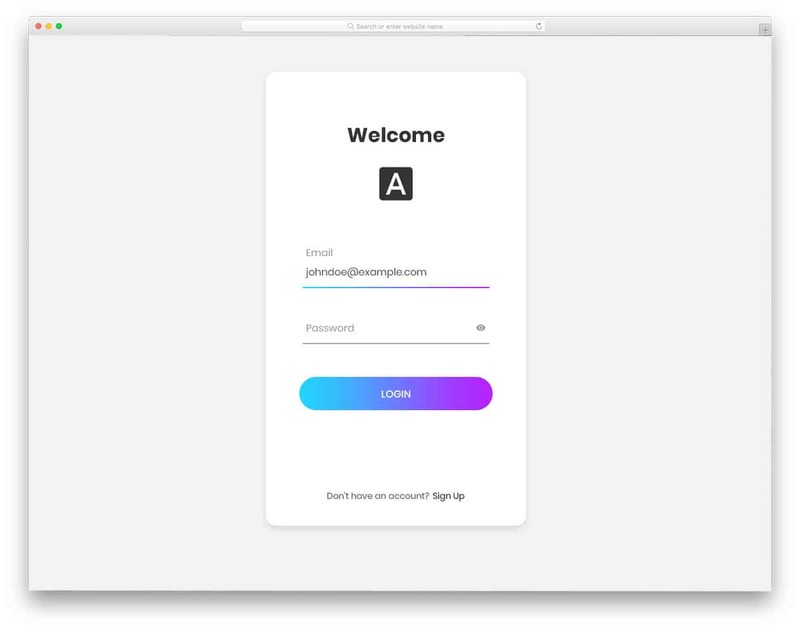 Creative Login Form is a plain simple form that you can use it on any website and applications. 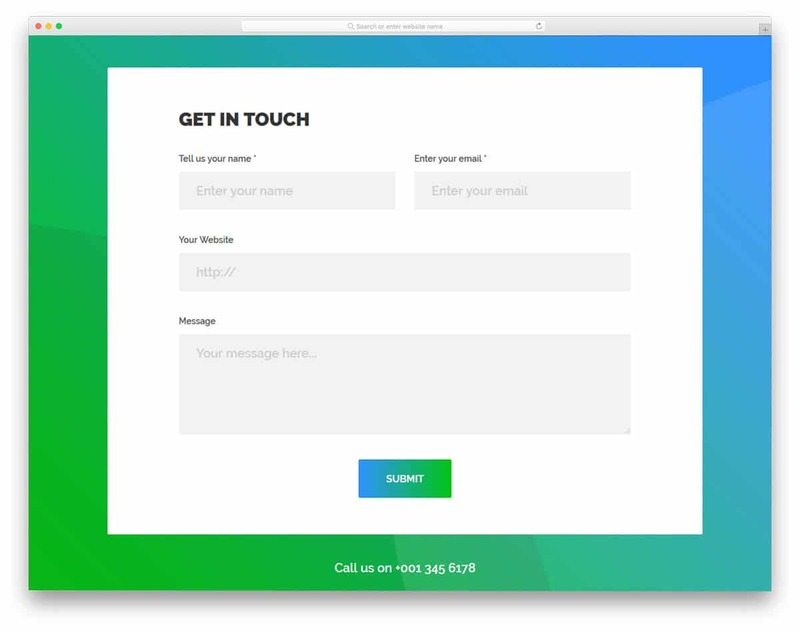 This form is almost similar to the Colorlib Contact Form mentioned above. As both the forms are from the same developer you can expect the same design quality and easy to edit code structure. In this form, the developer has given you both sign-in and registration forms. The toggle effect between forms is smooth and clean. Plus, both the forms easily fit inside the flexible box. No matter how many form fields you add the registration form, this form can easily handle it. Getting clear info about the person contacting you will help you reach them easily. If you are using the form for both contact purpose and inquiry purpose, this form will help you. The creator of this form has given you more than enough form fields to get clear info. Mandatory fields are marked with an asterisk symbol. The default font used in the form is bigger and easier to read. So even on the mobile screens, the user can easily read their content. 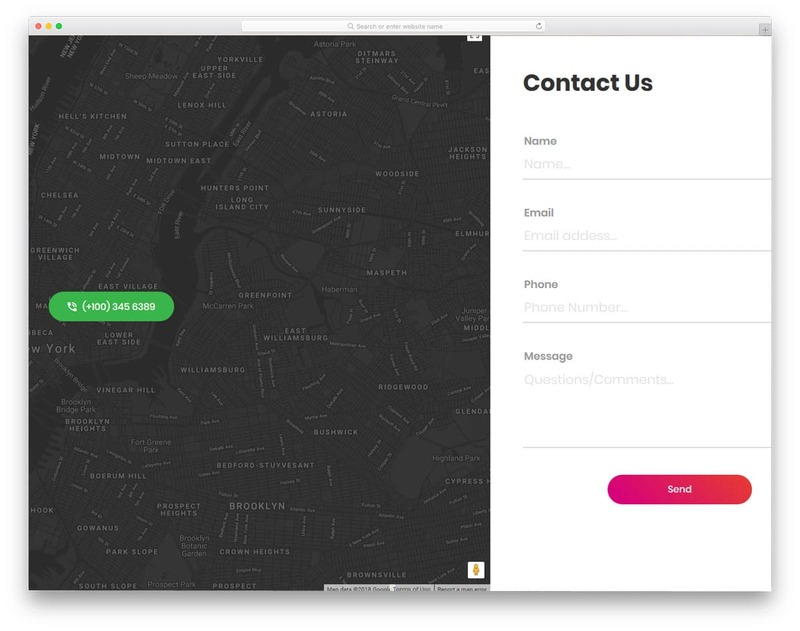 A gradient color scheme and a subtle hover effect are used for the call to action button. By making a few customizations you make this form perfectly fit in your website. 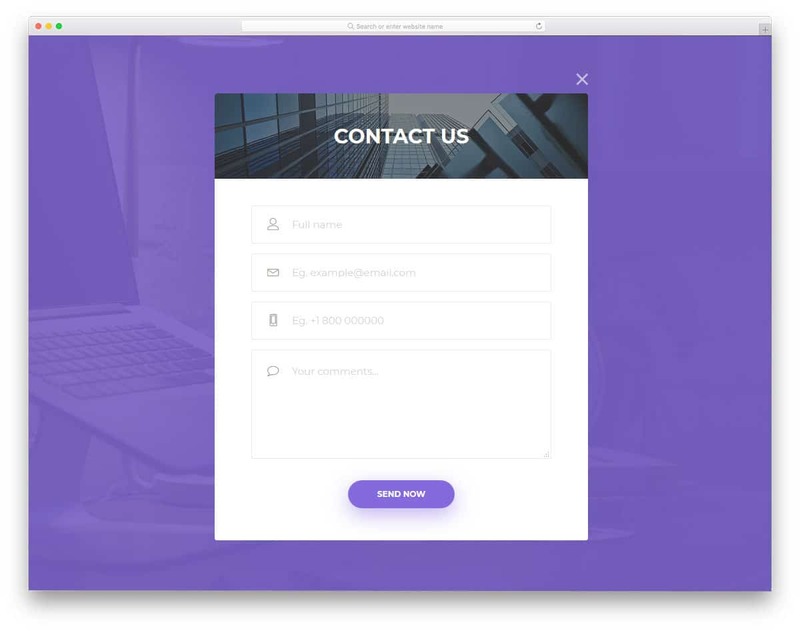 With the rounded corners and fine-drawn animation effect, this form fits perfectly in any professional websites. When the user selects a form field, it smoothly expands to indicate which field they are editing. Bold letters are used for the form field labels to clearly show what detail has to be given in a particular field. The default design is kept simple and minimal so that you can use this form for any website or application. Not only the design but the code structure is also kept simple for quick and easy customizations. As the form is perfectly working from the frontend, your work is reduced and you can concentrate on what matters the most. 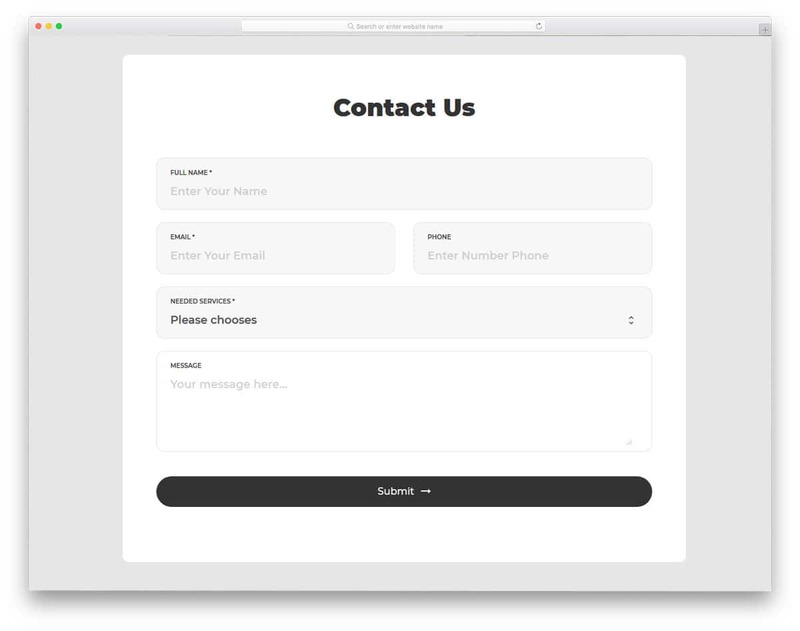 This contact form is the best addition for one-page website templates. If you have only limited space on your website, you can use a dismissable popup window-like design. The creator of this form has followed the same design strategy. When you click the contact button, a contact form appears in a full-page window mode. This saves the extra loading time and the user also can access the form easily whenever they want. Coming to the form design, icons and field labels are used to elegantly show the details and messages. Shadow and depth effects are used smartly to highlight important elements. 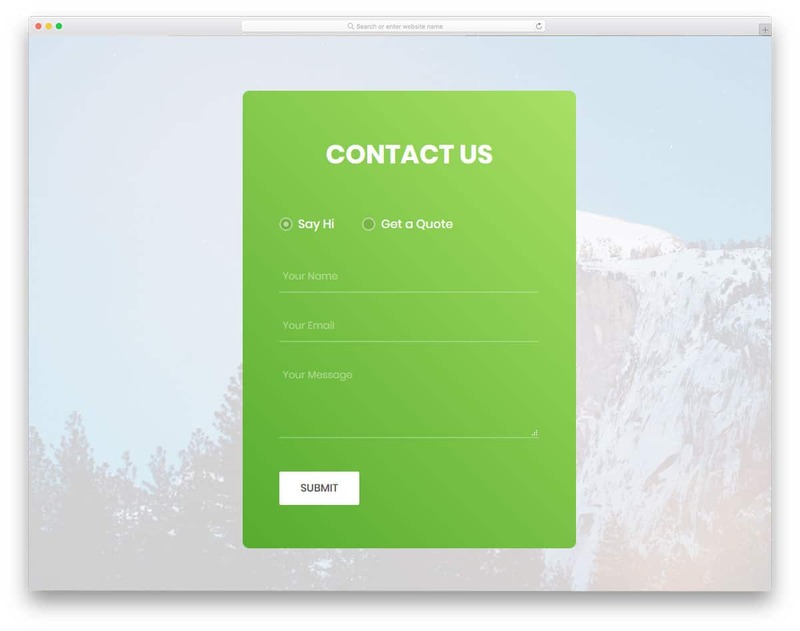 Contact Form v11 is a colorful form with modern elements. Since this template uses CSS3, you get more natural colors and fluid animation effects. In the default design, the creator has used a gradient color scheme on the background and for the elements on the form. Color shifting hover effect is used for gradient colors, which is a sensible idea. Below the form, you have space to mention your telephone number. If you are using this form in a hospital website, you can use this space to mention the emergency number. Out of the box, this form has a responsive design so you can use it in your responsive website without any issue. Contact Form v9 is almost similar to the V11 form template mentioned above. In this template along with the gradient background, you have a Google map widget. You can use this map widget to show your store or office location. As the form fields and the form layout, both follow the white background, shadow and depth effects are used to differentiate it. The form field supports field validation and the error message is shown when a field is left. Just like in the previous V11 form, in this also you have space to mention the emergency contact number. 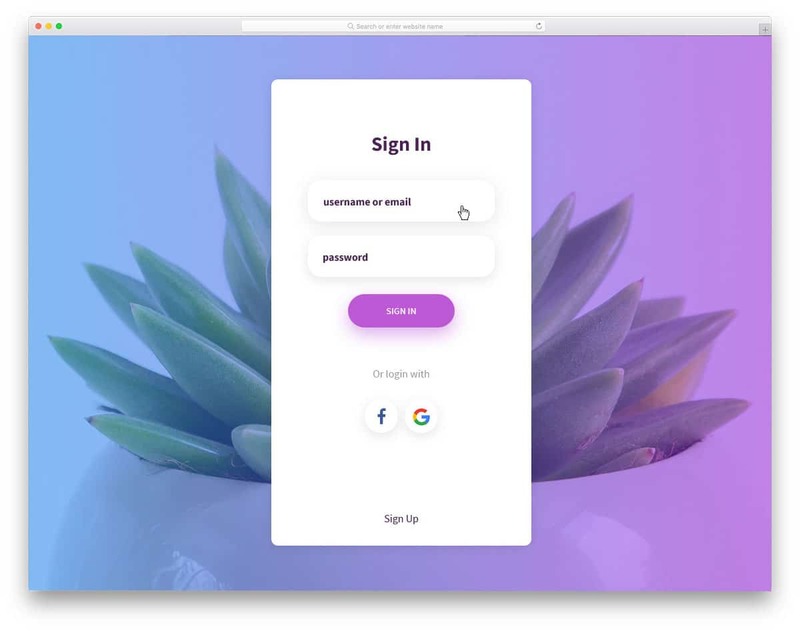 Login Form v2 is a clean looking login form, which you can use for both websites and mobile applications. The developer of this form has given you the option to show and hide the password field. Just like the contact form V11 mentioned above, this one also has a gradient color scheme for the call to action button. At the top of the form, you have space to add your logo. The center spot on the form gives the logo a better visibility. At the bottom of the form, you have space to add registration form link. Speaking of logos, take a look at our logo mockup collection to showcase your design on photorealistic images and properties. 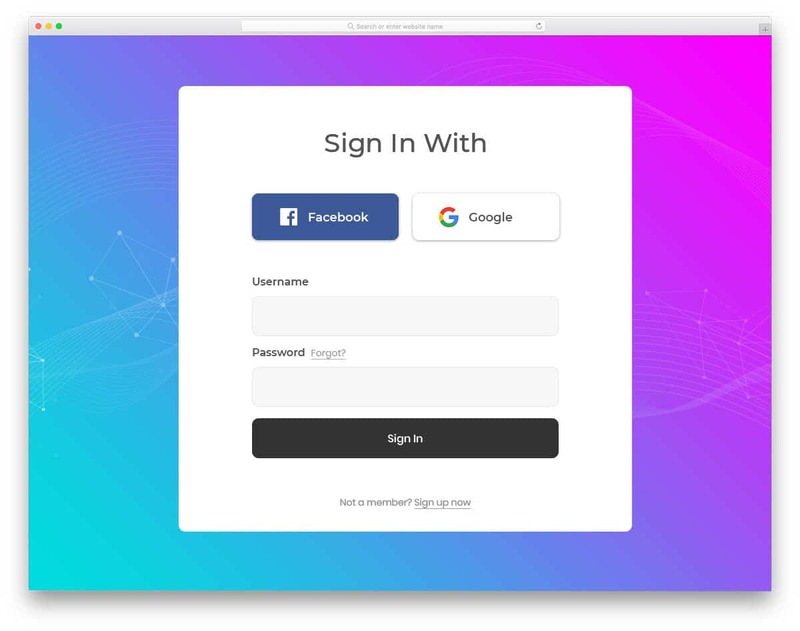 Login Form 4 is a sensibly designed login form. The designer of this form has given you all the option that a present-day user will love. Apart from the regular sing in option, this form also gives you social media login options and a “forget password” option. As present-day users are dealing with multiple digital accounts, giving a forget password option might help your audience. For the background and for the call to action button, gradient color scheme is used. If you have your own color scheme, you can easily edit this form to fit your design needs. 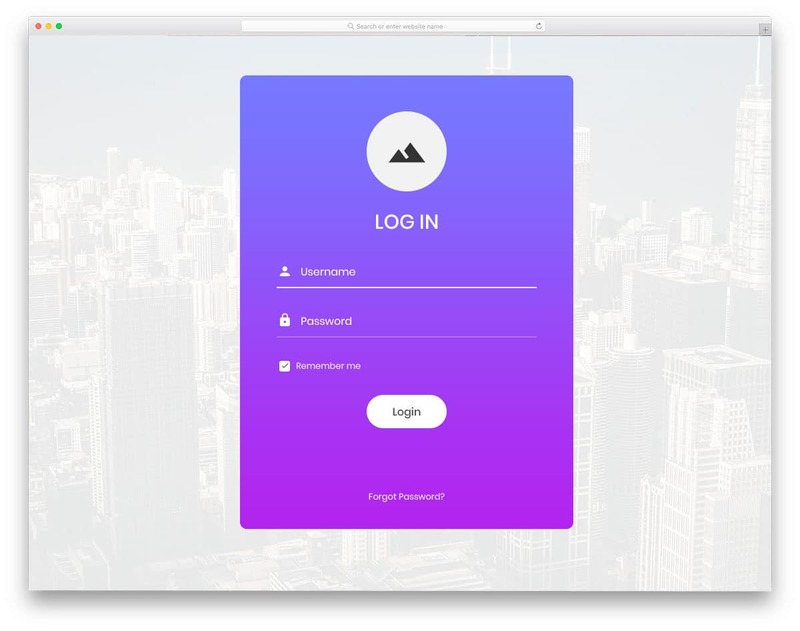 Login Form v3 is almost similar to the V4 login form mentioned above. 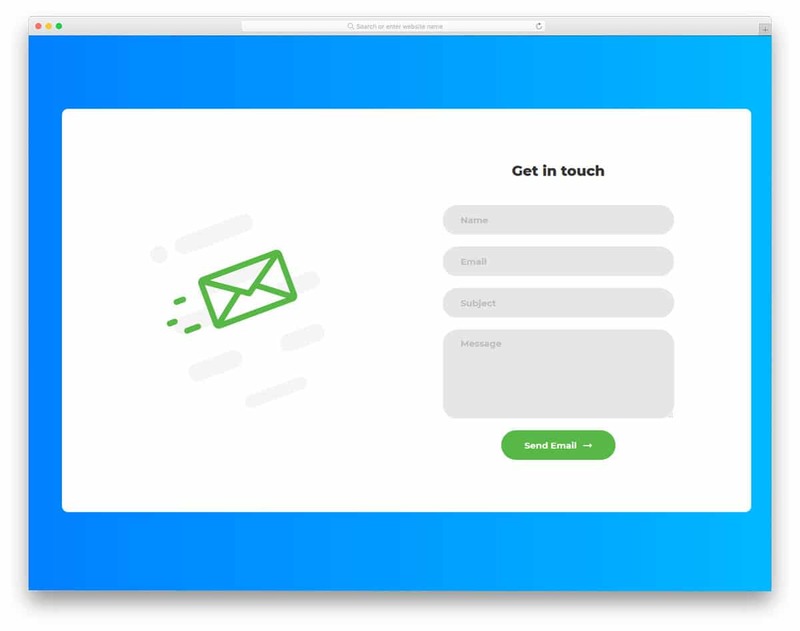 The input text effects on this form are clean and sleek so the user will get an interactive experience. At the top of the login form, you have place space to add your logo. 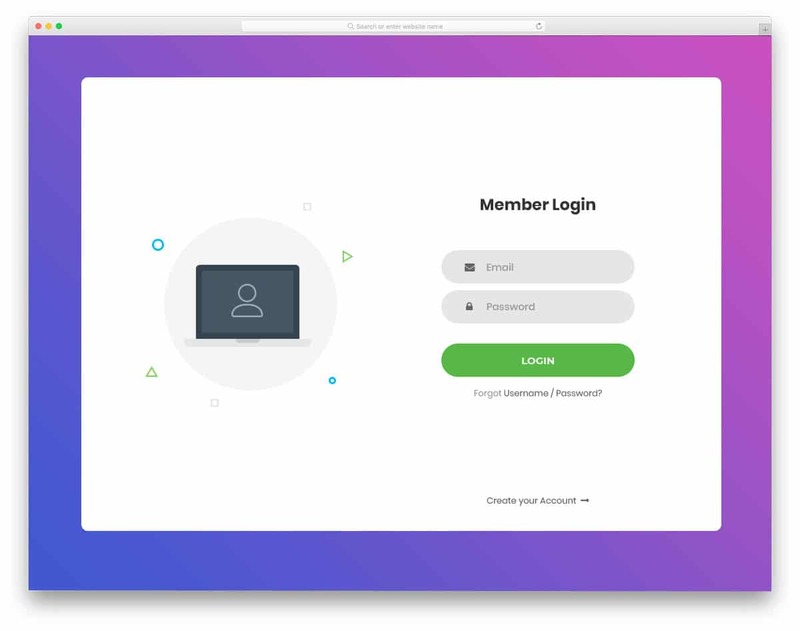 Because of the flexible and responsive form design, you can easily fit your logo on this form, In the demo, you get an image background for the full-page view. But, you can change or use it based on your needs. This form gives you a “Remember me” option, which let the user login for once and forgets about it on their trusted devices. Login Form 6 is the best option for user login or member login. If you are giving your users the option to just type in their password and login to the profile on the device they have logged in before, this form will come in handy This type of profile login option is quite familiar with Google and social media applications. To let the user know if they are logging into the correct profile, their profile image is shown at the top. This form also gives you the option to show the user profile image at the top. Because of the minimal design, this form easily blends in well on any type of web page. Login Form 12 is almost similar to the Login Form 6 mentioned above. At the top, you have space to show the profile image of the user. An image background is used in this full-page design. To make the form clear on the background a color overlay is used over the image. In this one also at the bottom of the page, you have the option to add a link to the registration page. 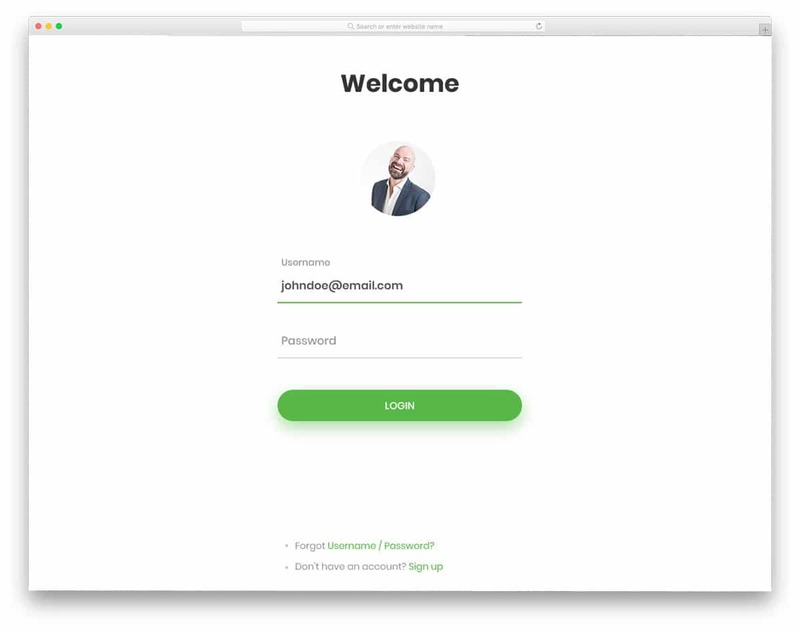 Because of the clean login form design, this one is the best option for dashboard login, Take a look at our free dashboard template, which has most of the options pre-designed for you.